Kavitha also expressed confidence that the Telangana Rashtra Samithi(TRS) will win 100 seats in the 119-member house in the assembly elections scheduled on December 7. Asserting that the existence of the TRS hinges on the “popularity” of its chief K Chandrashekhar Rao, his daughter and MP Kalvakuntla Kavitha said on November 25 that only he alone can bring the ruling party to power again in Telangana and rubbished suggestions it had a “covert” understanding with the BJP. 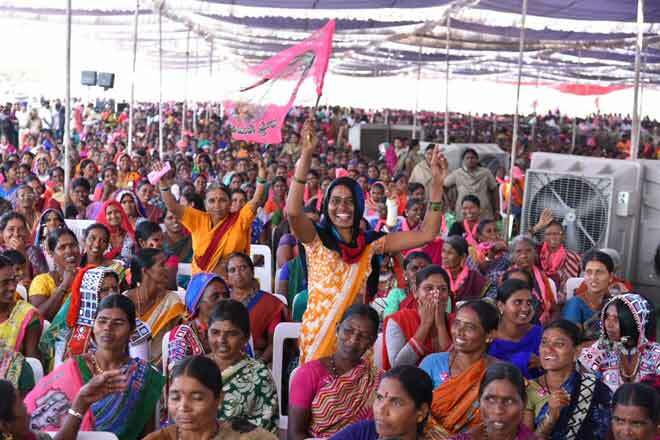 Kavitha, 40, also expressed confidence that the Telangana Rashtra Samithi(TRS) will win 100 seats in the 119-member house in the assembly elections scheduled on December 7. “My leader is my party. His vision is Telangana development. They cannot be separated and looked at in isolation,” Kavitha told PTI in an exclusive interview. Rejecting suggestions that her party had a “covert” understanding with the BJP, Kavitha accused the Congress of spreading such rumours to get minority votes. The comments come in the backdrop of widely believed power tussle between KCR’s son and his nephew T Harish Rao, a popular leader from Siddipet district and also a caretaker irrigation minister. Kavitha, a Lok Sabha MP from Nizamabad, said there is no power tussle between these two leaders and even if it exists the prospects of TRS will not be affected. “TRS is certainly going to win 100 seats. Even repeating of all sitting MLAs will not affect as they have been given tickets after vetting their performance,” she said. The newly formed state has 17 Lok Sabha seats. The Mahakutami is a grand alliance comprising Congress, Telugu Desam Party (TDP), Communist Party of India (CPI) and the Telangana Jana Samithi (TJS). Asked about candidates facing backlash from people over the party’s unkept promises of the 2014 election manifesto, Kavitha highlighted several promises been implemented including the KG-to-PG education scheme, irrigation projects, pension, scholarships among others. “There is no backlash from the people. There is backlash from political parties. 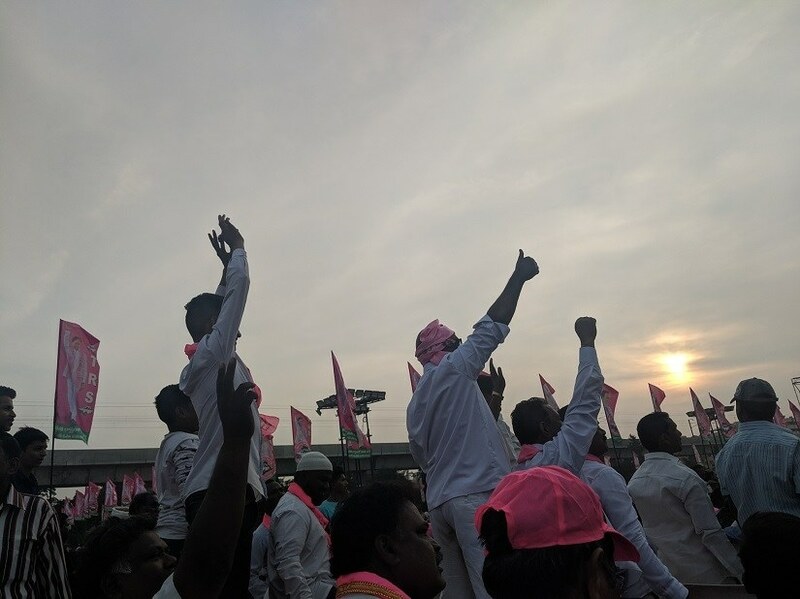 TRS is the only party which has fulfilled almost each and every promises made in the 2014 polls,” she said, and claimed the TRS government also cleared the Rs 11,000 crore debt of the Congress government. As far as 12 per cent job quota for religious minorities and scheduled tribes is concerned, Kavitha said, “We have passed a resolution in the assembly and it will be sent to the central government for approval. “If the Centre approves, we will implement. If they reject, then we will appeal in the Supreme Court and get it done just like the Tamil Nadu model,” she said. Hitting out at the NDA government , Kavitha said, “We have not got a high court despite asking for it in the last four and half years. The new state was ignored by the Centre which did not give enough grants. The kind of help NDA has given to its allies, certainly not given to Telangana. The Chief Minister wanted people to question TDP President N Chandrababu Naidu and Congress leaders over their failure to complete pending projects in erstwhile Mahabubnagar district during their previous regimes. In its next term, the TRS government will be implementing the health profile scheme of all citizens of Telangana State. The government which had successfully implementing the Kanti Velugu scheme, also plans to conduct eye surgeries in January after returning to power as well as deploy medical teams for conducting dental as well as ENT screening for all the citizens shortly. Making the announcement during the Praja Ashirwada Sabha held at Jedcherla in Mahabubnagar district on Wednesday, Chief Minister K Chandrashekhar Rao stated that soon after the elections, the government will constitute ENT and dental teams who will conduct the screenings for problems related to ear, nose, tongue and dental on the lines of Kanti Velugu eye screening camps. “Both the schemes will be implemented one after the other soon. We will prepare health profile of every citizens of the State including his/her blood group,” he urged. He questioned why either Congress or TDP failed to implement schemes like Kanti velugu, KCR kits and other such scheme to provide better medical services to the poor and the needy. “It must be because they lack humanity,” he declared. He said unlike Congress and TDP, TRS does not divide people on the basis of caste, religion or region, and the government schemes are an indication in this direction. The Chief Minister wanted people to question TDP President N Chandrababu Naidu and Congress leaders over their failure to complete pending projects in erstwhile Mahabubnagar district during their previous regimes. 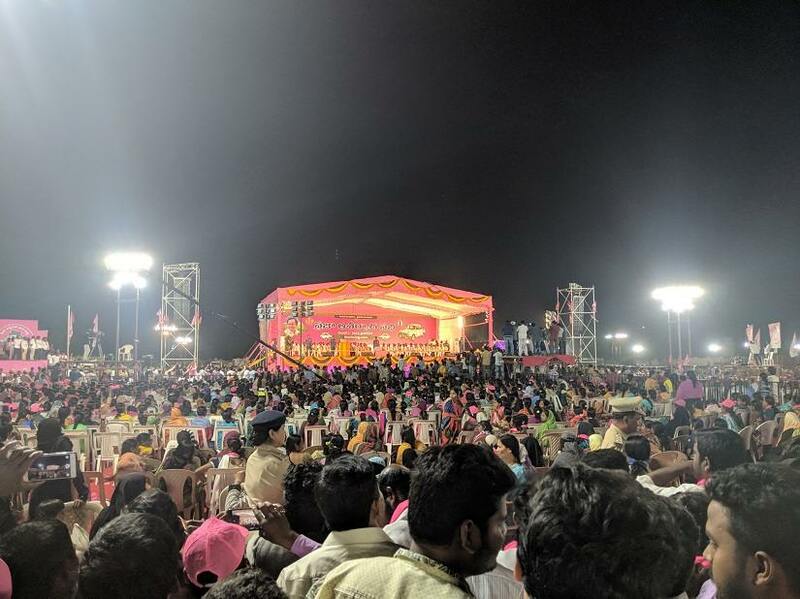 He pointed out that Chandrababu Naidu and the subsequent Congress governments have turned erstwhile Mahabubnagar district into a district of migrants. “Chandrababu Naidu adopted the district but failed to take up any development programmes during his tenure as the Chief Minister of undivided Andhra Pradesh. Since the separate State formation, he has been attempted to obstruct the Palamuru Lift Irrigation Scheme and seeking votes from the same citizens of Palamuru region without any shame or guilt for the injustice meted out to them by him,” he said. Gajwel, situated at about 60 kms from Hyderabad, has a total of 2,27,934 voters, including 1,14,362 male electors, 1,13,554 female voters and 18 others. Rao’s main rival in the contest is Vanteru Pratap Reddy (Congress), the nominee fielded by the “grand alliance” (Congress, TDP, CPI and Telangana Jana Samiti). In the December seven Legislative Assembly polls in Telangana, Gajwel in Siddipet district is a key constituency as TRS Chief and Caretaker Chief Minister K Chandrasekhar Rao is seeking re-election from the seat. On behalf of other major parties, Akkula Vijaya of BJP is in the fray. Pratap Reddy took on Rao in the 2014 Assembly elections as well (in undivided Andhra Pradesh) as a TDP nominee and he managed to get 67,303 votes against 86,694 votes secured by the TRS Chief. Narsa Reddy of Congress had obtained 34,085 votes then. Pratap Reddy has since joined Congress and is banking on the combined strength of TDP and Congress. 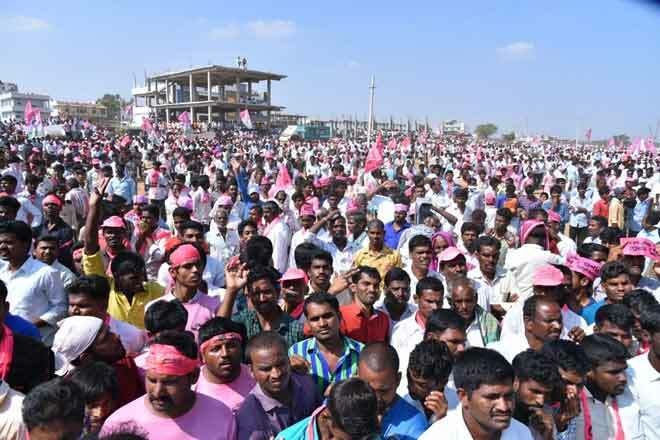 However, the TRS is relying on the massive development works and welfare schemes undertaken during the last over four years of its government to ensure an emphatic win for Rao. The major development works include improved roads, power and water supply, an education hub (of academic institutions), market godowns and hospitals and other infrastructure facilities. “Eighty per cent of the polled votes would be in favour of us. It would be outright (win),” Rao’s political secretary S Subhash Reddy told PTI. He cited 24-hour power supply to farm sector, copious supply of fertilisers, ‘Rythu Bandhu’ investment support scheme and farmers’ insurance scheme as examples for some of the welfare measures undertaken by the TRS government. Rao’s nephew and irrigation minister in the Caretaker government T Harish Rao, who is the TRS candidate from neighbouring Siddipet segment, has been leading the TRS campaign in the constituency. Pratap Reddy, however, alleged that the TRS government has failed to implement its promises, including three acres of land for Dalits, students tuition fees reimbursement, employment generation and drought relief for farmers.